With St. Patrick’s Day coming up, I thought it would be the perfect time to make some Irish Stew. I don’t make stew very often, but I love a bowl of good, thick, chunky stew, and that’s exactly what this is! You might be wondering where those chunks of stew meat are–well, I improvised a little and used ground beef instead, since that’s what I had on hand. But you can use either–ground beef or chunks of beef. There are plenty of other chunky ingredients in this recipe too–onions, potatoes, and carrots. And it’s seasoned with a little dried thyme and basil. Comfort food in a bowl–that’s what this is! In a large saucepan or Dutch oven, combine beef, beef broth, onions, and pepper. bring to boiling, then reduce heat. Cover and simmer for 45 minutes. Skim off the fat. Add the potatoes, carrots, thyme, and basil. Bring to boiling, then reduce heat. Cover and simmer for 30 to 35 minutes more or until vegetables are tender. Stir the cold water and flour together, blending well. Stir this mixture into the stew and cook and stir until stew is thickened and bubbly. Cook and stir 1 minute more, then season to taste with salt and pepper. Garnish with additional dried thyme, if desired, and serve. If St. Patrick’s Day will be chilly where you live, this would be the perfect thing to make to warm everyone up! Are you planning on making any special Irish dishes that day? Linked to Sunday Showcase, Inspire Me Monday. This entry was posted in Food and Recipes, Seasonal, St. Patrick's Day and tagged Carrot, Irish Stew, Onion, Potato, Stew on March 15, 2015 by nancyc. Yummy! Have a lovely day tomorrow! I love stew with all of the veggies and meat. Your stew reminded me that I haven’t made it for too long. Hi Nancy, love a hearty stew, this looks delicious! The ground meat is a nice change of pace from the chunks of meat. 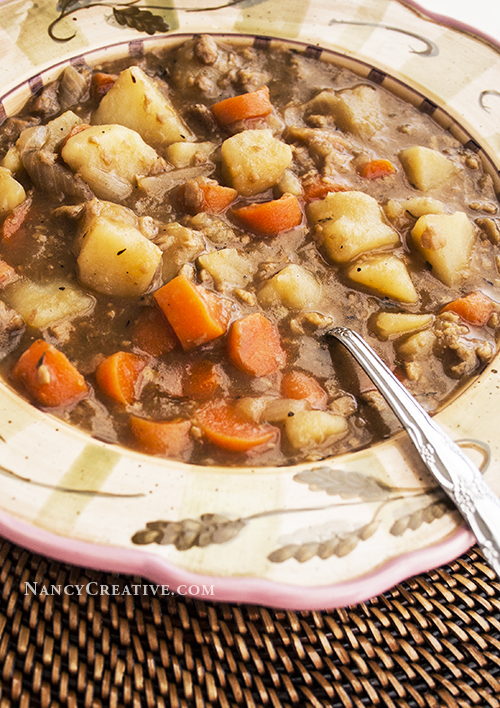 This bowl of stew looks inviting and delicious, Nancy! Happy St. Patrick’s Day. I love a hearty stew, yours looks delicious. Looks delicious, like the idea of using ground beef instead of chunks. Visiting from Inspire Me Monday. I love beef stew! I made a big pot recently. What a novel concept of using ground beef, instead of beef tips. I’ll have to remember that one. lol Have a tastetastic week!